You are here: Home / Notes 101 / What is a Land Contract? A Land Contract is a type of owner financing that allows the buyer to make payments to the seller for a home or land purchase. The buyer gets to use the property but the seller hangs onto official title until paid in full. The contract comes under several names including Real Estate Contract, Contract for Deed, Installment Sale, and Land Contract. It is an alternative way to document the seller financing arrangement from the more common Note and Mortgage or Note and Deed of Trust. One big consideration with a Land Contract is that the buyer will not receive the Warranty Deed to the property until the purchase price is paid in full. That means the seller stays in control as official title holder while the buyer makes payments. Think of the contract like a layaway program for the Deed. So what’s the big difference? Well with a Deed of Trust or Mortgage the seller provides a Deed to the buyer at closing, transferring title to the buyer. Then the buyer simultaneously gives back a Purchase Money Mortgage (or Deed of Trust in some states) to the seller for the portion financed. When the amount financed is paid in full the Lien is simply satisfied. When the seller holds fee simple title using a Real Estate Contract the buyer is holding equitable title. Since the buyer does not yet have the Deed it is almost impossible for the buyer to obtain any type of secondary financing unless the Contract is paid off. If the buyer quits paying and the seller needs to take back the property, a Real Estate Contract has the advantage of being faster and less expensive than a drawn out foreclosure process on a Mortgage or Deed of Trust. The accepted use of a Real Estate Contract varies by state. They are common in many Western states like Washington, Oregon, Idaho, and New Mexico along with some Mid-Western states such as Michigan and Wisconsin. However a few states, like Texas, have passed regulations to prohibit use of Contracts for Deed. 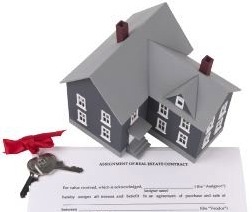 A Real Estate Contract can be unrecorded or recorded at the county level depending on local practices. A seller can also sell contract payments for cash now. Just know that some investors may require conversion to a note and mortgage or a note and deed of trust. A knowledgeable title company or real estate attorney can assist in selecting the best method of documenting the seller-financed transaction. For more information on buying or selling with contracts read Personal Profit Series: Notes – The Complete Money Making System to Buying, Referring, Creating and Holding Real Estate Notes!